The drought continues on Nevis as well as other islands in the Caribbean. My weather station has recorded a small amount of 0.12 inches rain for the month. At this rate water is becoming a precious commodity. Things are looking very dry, grass went from lush green to burnt brown. I'm guessing this will continue till the hurricane season starts bringing those rain waves from Africa across the Atlantic. Temps are in the high 80's deg. F range. Guess our visitors are enjoying the "fine beach weather" but the remainder of us WANT RAIN! Maybe next report will be "IT RAINED TODAY"
March has been a very dry month with only 0.36 inches of rain recorded for the month. Temps have climbed into the mid eighties with the warmest day at 87.2 deg F. From other reports it seems most of the Caribbean is reporting little rain. What a change from previous times....tons of rain to no rain. Cisterns are running out of water. Water is being rationed by the Nevis Water Dept. If you are on government water you may get water from 8 pm to 4 am. Hours are dependent on where you live on the island. Have seen water trucks delivering water to the snow birds cisterns....you know the folks who don't understand about water conservation during dry times! In fact they don't know where the cistern cover is! Looking at satellite images it seems April is setting up to repeat March. Hopefully 1-2 inches of rain will fall during that time. 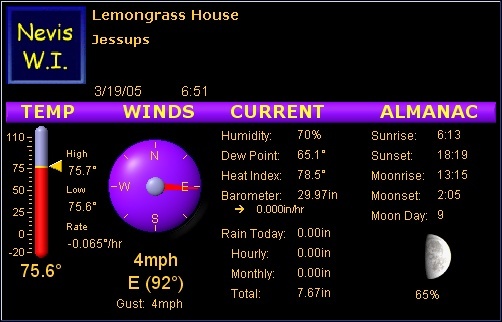 Well here it is 19-Mar-2005 and I'm here to report I have had no measurable rain since 01-Mar-2005. Seems we went from cool-rainy to warm-sunny in one day. Weather has been absolutely beautiful with sunny skies and a gentle breeze for the last 19 days & looking at satellite pictures it will continue. Have had to start the drip irrigation system as the ground is taking on that parched "hard as a rock" look. 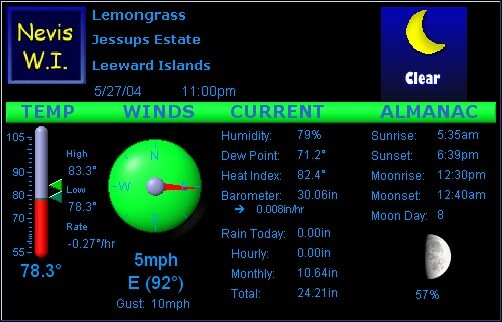 Temperatures have been averaging 85 deg day with 74 night time lows. All is well in paradise. Safe traveling to our visitors. - Showery Today & Yesterday & Tomorrow?? Looks like rain is the order for the day, with peeks of sun (very little from where I sit). Maybe where you live Lynn H. it's sunny there. I think tomorrow will be another showery day from the looks of weather patterns. Hum... maybe golf maybe not?? Oh wait !!! Sun is out now. This is confusing me. What will it be? February is proving to be a dry month, right in line with yearly statistics. Everyone seems to be happy about the sunny dry days, especially after the prolonged wet weather of the last few months. Temps have been quite cool at night. I recorded two nights in Jan with temperature lows of almost 68 deg F. Relative Humidity is at a all time low with readings in the high 50% to low 60%. 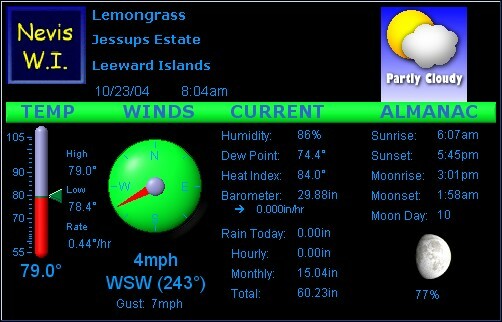 Attached the weather station jpeg snapshot of readings at time of this message. Well it looks like we are into a very, very, good weather pattern. No storms for hundreds of miles. The Christmas winds have finally left us so things are calm with gentle breezes. I need to get back out on the sail boat!!! Maybe some pictures ned update. Since Jan 1st I now record over 2 inches of rain. Just isn't much sun to tan up those visitors here on Nevis. It's been bathing suit with umbrella type of days. Putting weather map in animation doesn't show a definite clearing trend. Looks like rain clouds keep building during the 4 hr loop. Christmas Winds are still with us. This is the time of year when those chimes hanging on the veranda are at their loudest. The sound is soothing. If interested the wind chime came from Mohonk Mountain Resort in New Paltz, NY. New Years Eve was a star filled evening....no not with movie stars. It was a great night to watch the fire works display, complements of Four Seasons Resort, while at Sunshine's on the beach. The year 2004 proved to be a wet one for Nevis. The "normal" or should I say "average" rain fall here is about 48" annually. Talking to old time farmers here and on St. Kitts I've been told to expect 4 years of wetter then normal then 4 years of drier then normal weather. They also said during these wet cycles hurricane activity is less. That doesn't follow this year though! I guess they figure "less" if the island is spared a hit. Time will tell on those predictions. I've attached a text doc showing the monthly data for the year for those interested in stuff like that. I've been told by a few folks to do more reporting so I'll make more of a effort during the "good weather" times to do that, along with some photo's in and around Nevis. Normally we tend to report about bad weather conditions but today is just to spectacular a day not to let the world know about it! 78 deg F 62% humidity. I like to call this weather a perfect Vermont summer day. For anyone in VT on a day like today you'll know what I mean. Others can have a look see at some images I just took. Did some experimenting with the spotter scope. 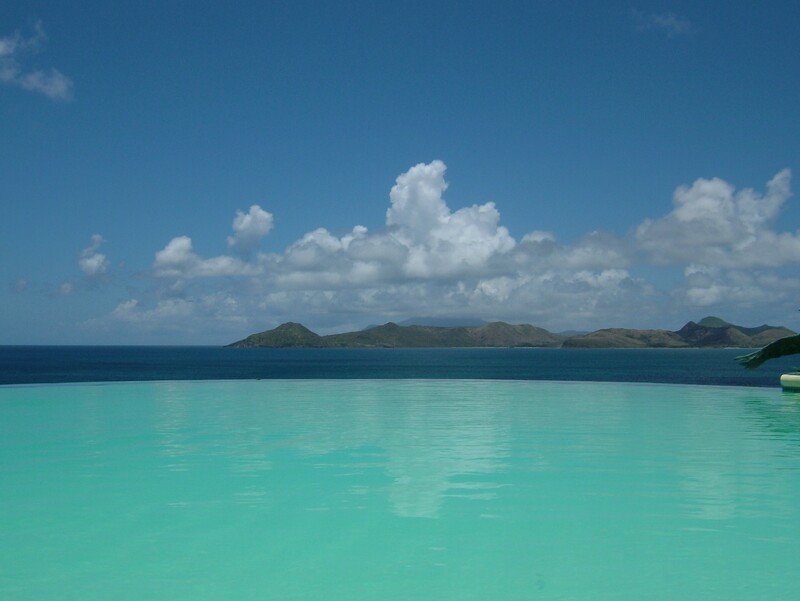 Images are looking Westerly to St. Kitts. One spotter photo is the harbor at Basseterre. Maybe today will be without rain ??? Since this crazy weather pattern developed, in Oct 04, to date I have recorded 33" of rain. Since Nov 1st we are at 15.5". Everyone is talking about it. Most folks say they can't remember anything like this since the 1970's. Wasn't here in the 70's but I can verify we are water logged. The beaches are murky with all this water run off. Some beach erosion has occurred in various places. Some of the village roads have deep ruts. Most ghauts are running strong. For sure everything is green!! Looks like the rain just won't go away. Another area of rain producing weather seems to be caught between the Easterly & the Westerly patterns and keeping us wet (and green). Nevis is now at 71" of rain for the year with 7.6" so far this month. At this rate we'll top 85" - 90" for the year. I attached a avi movie showing the amount of water flowing thru the yard. I can say things are wet & soggy after another 5" of rain in the past day. Combine that with almost 5" from 1 week ago & I now register 15.04" of rain for the month. 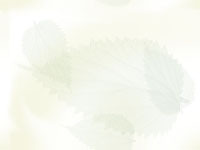 Today has dawned sunny with blue skies.......but images show more rain is heading our way. Oh yes, we did have minor flooding. Water over the main road in places, some deeply rutted village roads. Correction - deeper rutted village roads! The eye of the storm is about 68 miles (110 km) away. Things are quieting down now. Recorded .94 in of rain with gusts to 34 mph. I'm sure they were higher in unprotected areas of the island. Cloud base seems to be lifting. Rain has stopped. Occasional gusts to 12-15 MPH. Storm is moving away in a WNW direction. Above results are from NOAA 2 pm fix & StormCarib "distance calculator"
Hey, even cable & power are back on ???? Life is good. 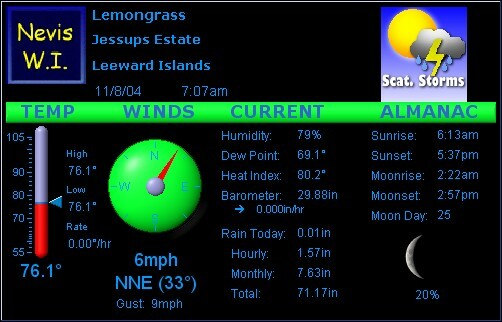 Latest Report from Nevis....slight breeze 9-12mph. Very little rain. Nevis is not on the Tropical Storm Warning list but we're so close we mind as well be. Will post later if things become nasty. AT 5 AM AST...0900Z...THE TROPICAL STORM WATCH FOR SABA...ST.
VIRGIN ISLANDS...SABA...ST. EUSTATIUS...AND ST. MAARTEN. Seas are calm. Slight breeze. Clouds above. No effects from "Frances" at this report. Warnings have been discontinued by Govt. of Antigua for Nevis. But will still keep one eye over my back. 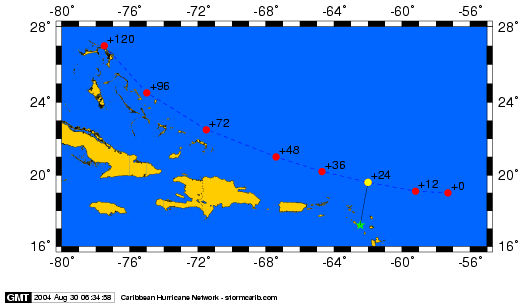 NOAA projections for Nevis & Frances Closest Point of Approach is as follows. Latest Data say TS force winds extend out to 125 Mi. Nevis should be OK? Keep a close watch folks. Will post again tomorrow! The approximate Closest Point of Approach (CPA) is located near 19.6N, 62.0W or about 167.7 miles (269.9 km) from your location. The estimated time of when the eye will be at that location is in about 23.9 hours. Tropical Depression south of Nevis is producing locally moderate to heavy rains as of this moment. Rain is falling at the rate of 1.30 inches per hour. No wind to speak of is associated with this band of rain. Today will be a stay inside day for sure......unless your a duck! Tropical Wave over Nevis now isn't all it was cracked up to be! NOAA warned yesterday we could experience strong gusts winds but to date nothing out of the ordinary. This is a good thing! We are getting periods of rain. In fact right NOW it's raining on the horizontal. It's safe to say the 'normal' weather has returned to us! FINALLY. It's been 4 days w/out rain.....Nevis is back to the sunny, fair weather clouds which is good for the disposition. Since 08-May to 23-May I've recorded 9.6 in of rain. That's when the worst of the weather pattern just hung around these parts of the Caribbean & kept us in clouds & rain for 15 days.